When detective Kushanagi of teh Tokyo Police tries to piece together the events of that night, he finds himself confronted by the most puzzling, mysterious circumstances he has ever investigated. Nothing quite makes sense. FL Speak - Possibly the best crime novel I've read after "The girl with the Dragon Tattoo". Its not surprising since people are comparing this Japanese author to Stieg Larrson. However the main character in this novel is neither Yasuko nor the detective Kushanagi. Its Yasuko's neighbor Ishigami, a brilliant maths teacher. When Yasuko's ex husband returns one night and threatens Yasuko and her daughter, a fight erupts and Yasuko and her daughter end up killing the man. Ishigami, who has had a crush on Yasuko since she moved to their flat, offers his help. And then he creates such an elaborate story and alibis that has the detectives baffled and his superiors astounded. Without speaking a lie, Yasuko and her daughter, build an alibi with the help of Ishigami. Meanwhile, clues emerge from the crime scene that leads the police elsewhere. But lack of possible endgame, brings the detective back to Yasuko. Even as their alibi's are held up under intense scrutiny, Ishigami prepares to lead a normal life. Yasuko and Ishigami rarely talk, even after the incident. However, to know what's going on with the investigations, he calls up Yasuko every night and asks her about her day. The chance  meeting with Kudo, once a regular customer of the bar where Yasuko worked, brings out the jealousy in Ishigami and yet he never speaks his heart to Yasuko, content only with keeping her and her daughter safe. But the arrival of an old genius, Ishigami's classmate, Yukawa into the investigation brings a new twist. As the dominoes fall into place, even Yukawa's presence fails to solve the case. But slowly, as bits and pieces crack, Yukawa can only shake his head as the brevity of the crime becomes apparent. Yukawa becomes convinced that somehow Ishigami is involved in the case, while the police belives Yasuko to be the main suspect. As all the clues keep coming back to Yasuko and yet her alibi stands, the police turn their focus on Ishigami. But when Yukawa realizes what Ishigami has done, his only concern is saving his friend from the consequences that was to follow. But not everything goes the way they are planned. And Isigami is faced with a situation where he must decide how to proceed and Yukawa should decide if he's willing to lose ishigami as a friend for the sake of an investigation or is he willing to lose his friend, the detective Kushanagi. The beauty of the lie is that it isn't a lie. And everything else is built on that little truth no one knows about. But when the webs of deceit are laid bare, they are left with the sheer impossibility of brilliance of the plan. 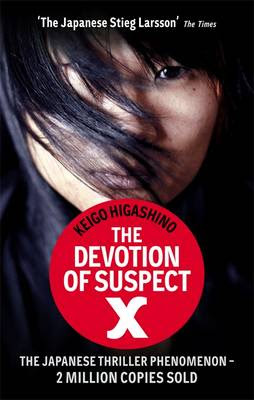 The Devotion of Suspect X deals with the unflinching devotion and love a person can offer in the face of greatest extremities, of the impossible length a person is willing to go. Exceptional writing, the crime is committed in the first 20 pages. The rest of the book is about cracking the case for the detectives and misguiding the police with subtle truths by Ishigami. Phenomenal work! You'll love it. Who says mathematicians are boring? This man will blow your mind off!